The beautiful country, Thailand, the Land of Smiles, a place that I haven’t visited for many years and a place whereby my friends around me constantly travel up there for their short holidays. When the idea came out to book cheap budget airline tickets in advance by Sue, the 3 of us, Sue, Amanda and myself finally decided to travel out and a short trip up to Thailand, our first overseas group holiday, with the intinerary planned by Sue’s dad, an experienced travel guide and very knowledgable about Thailand. Flying with Tiger Airways, leaving on a weekday Wednesday morning at 0640 hours, we arrived at Bangkok International Airport, sorted our things out and we were on our way with our friendly and experienced tour bus driver and his comfortable 10 seater bus, friend of Sue’s Dad. 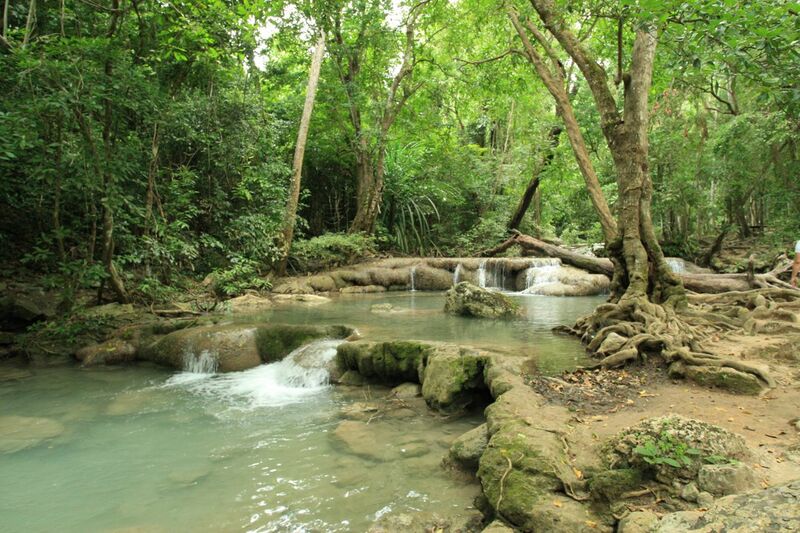 Our first stop wasn’t Bangkok, it’s visiting Erawan Waterfall in Kanchanaburi before heading to the beautiful home stay resort in Amphawa. Before continuing on our long journey towards Kanchanaburi, we reached The Mall Bangkhae at the outskirts of Bangkok for brunch and shopping, I was highly impressed by their supermarket size and varieties, McDonalds upsized meals and pork burger! Upon reaching Erawan National Park, after about 2-3hours of driving, we had a late lunch/tea break and it was simply superb and delicious. After our hearty meal, we rushed to trek up the Erawan Waterfall, a 7 tier waterfall due to the opening hours and could only venture up to the 2nd tier. Although it was a short trek, it was an awesome experience and view, simply superb, beautiful, peaceful, tranquil and zen, I will return again one day to conquer all 7 tier! 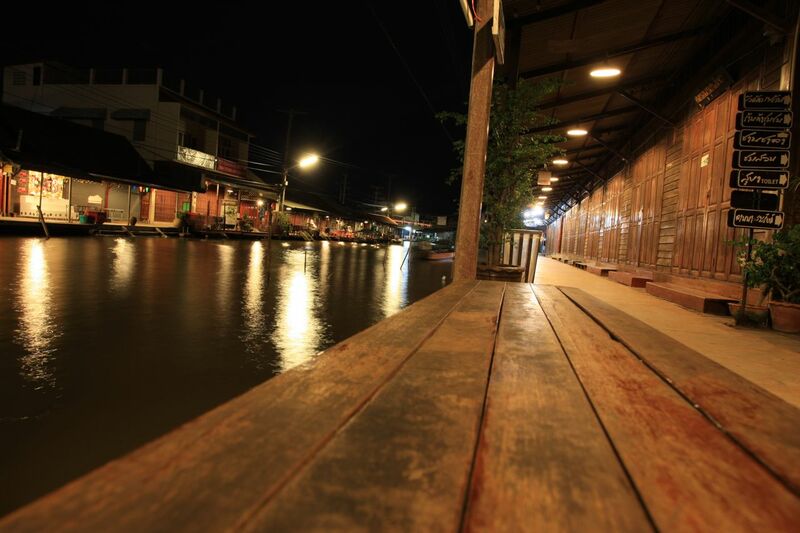 Upon leaving Erawan National Park, we headed to Amphawa for our home stay and it was quite a long journey due to the distances between these 2 areas. 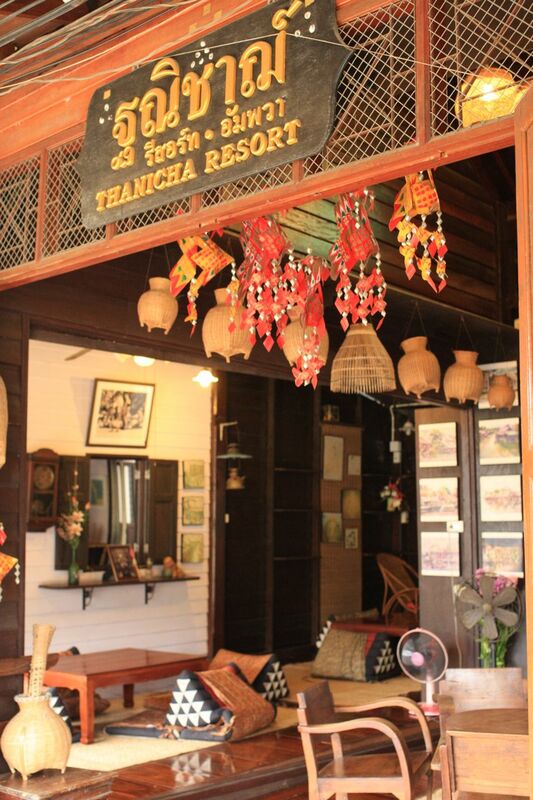 It was pretty late upon our home stay, Thanijha Healthy Resort and I loved this place! Beautiful, cosy, modern and relaxing, a boutique resort in Thai style and hospitality. Great for a small retreat too with their facilities for small meetings and discussions. Waking up in the early morning, to catch the sunrise and watching the locals and guests giving offerings to the monks. 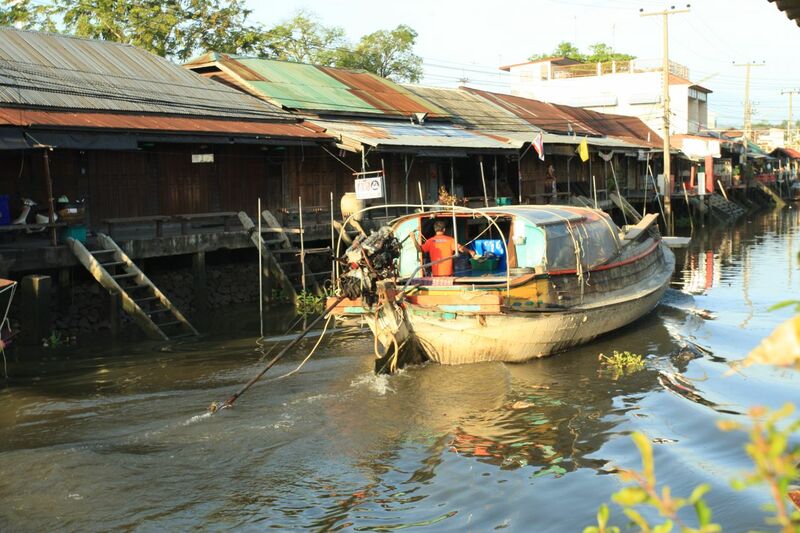 We had our own chance to give offerings too and learned more about the local culture and practices there, the early morning was tranquil and quiet, maybe it’s a weekday morning since Amphawa is famous for their weekend floating market, for the locals and tourists. Even though we couldn’t get to see the busy floating market community, being there and enjoying the food, culture and people was just as great and wonderful. 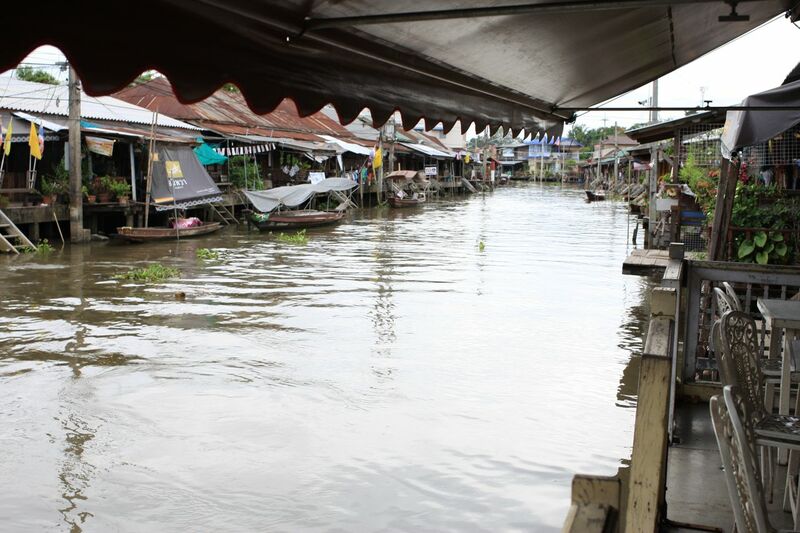 The local wet and day markets, the local friendly Thailand folks, the cute cats & dogs too! It’s like stepping back in time for me, away from modern technology and the crazy hectic pace of city life, the slower pace of life just suits me fine during the 2 days there. We all travel to nearby town Mae Klong with their local bus, immersing in their local activities and daily life, is definitely a very interesting adventure with language being a barrier and not really knowing how their local society operates. Sue’s dad was able to handle all of that and we really had a great adventure. 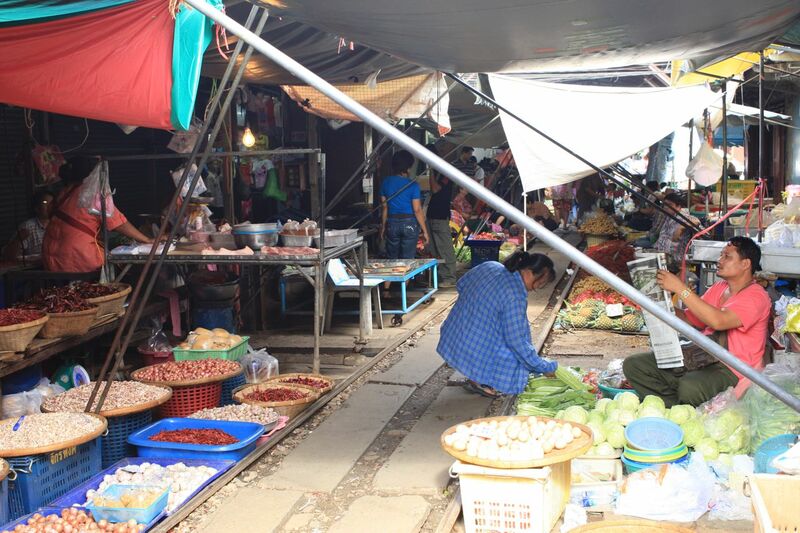 The town of Mae Klong is probably quite well known around the world with their Mae Klong Market and the Mae Klong Railway, with the market stall holders keeping their shelters at a moment’s notice before the train moves through the heart of the Mae Klong Market. 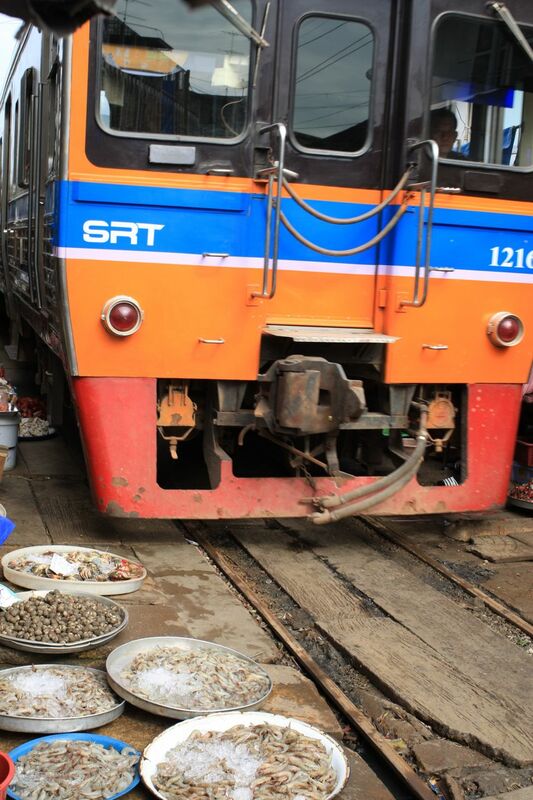 Once the train passed them, normal wet market operations resumed and the shelters will be returned to their original position and the locals back to their daily way of life in the wet markets. Even though I saw it on television before, being there and experiencing the train traveling past you so near in the face with all the action around it is simply an experience that cannot be felt and enjoyed watching it on the television! Back to Amphawa, for an afternoon rest before heading out to the day markets, enjoying the local food and more street and travel photography action, before a nice Thai dinner on a floating restaurant on the river, another round of delicious Thailand food feast, that would come in another post shortly. Finishing the meal, exploring the night streets and markets of area before resting for the night. I thoroughly enjoyed my first 2 days of holiday in Thailand and hoped to return again soon for more photography adventures! Stay tuned for more of my Thailand travel adventures coming soon!